Game for over 10 people. You should play this at a party or an event while everybody is doing other things (going around and talking to others). You can set the game length to be short or last a whole day. 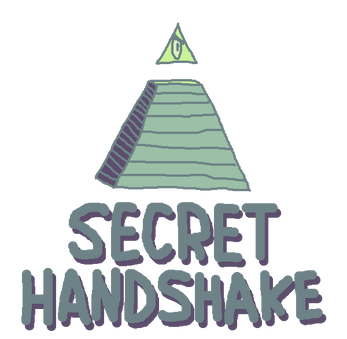 “Secret Handshake" has two teams (or secret societies) communicating in secret while the other group tries to trick them into revealing their secret handshake. To start the game you need two captains (or founders of secret societies). You can vote who gets to play the role or pick two random players for it. Even if each of them belongs to one society, they will be playing a neutral role in the game, more like judges. Each captain must come up with a name and a secret handshake for their society, it doesn’t have to be a literal handshake, it could be a password or a sign. It’s something your members will use to identify each other. Get as many pieces of paper as players in the game (not counting the captains) and give half of them to each captain. 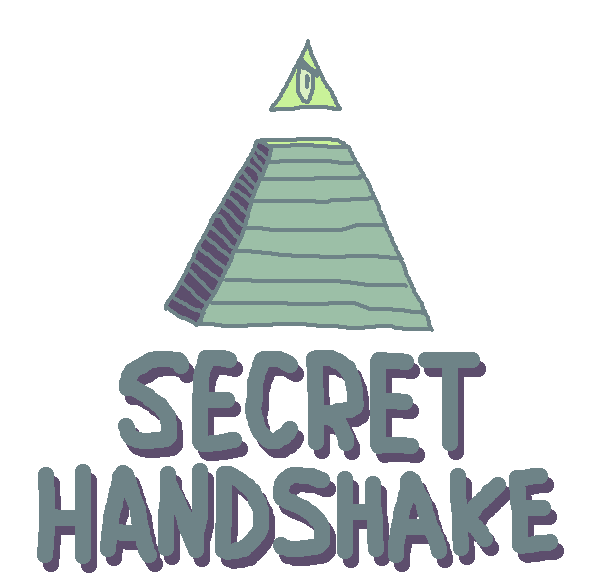 They have to write down their name, the name of their secret society and the secret handshake (on each piece of paper they got). Then each captain picks two papers from their society. They write down a place to meet on one and a time on the other. If you’re in a house you could set something like a specific corner of a certain room, if you’re in a bigger space you have more freedom. The time will set the pace of the game, you can do something short (like let’s meet in 15 minutes) or something that lasts several hours. Remember this is something meant to be played while you’re in a party or an event and people are already going around and talking to others. You won't be fully focused on the game the whole time. Fold the papers and let every player (except the captains) pick one. The game beings once everybody has their paper. All your members get to the right place at the right time. You find out the secret handshake of the other team or the details of their meeting (time or place). If both teams fail to meet as planned, then everybody loses. You don’t deserve to be considered a real secret society. If everybody gets to their meeting without spoiling secrets, then everybody wins. Captains are the ones responsible for checking the result. If you think you’ve discovered the handshake or meeting information of the other team then report it to a captain (it doesn’t matter the society they belong to). Captains know all the secret details of both teams, so they can check whether or not a player got it right. REMINDER: Captains are neutral, while they belong to one of the societies they don’t win or lose. So they are not allowed to help anybody. Each team can only try to guess 3 times and captains may tell a player how many tries their team has left. Instead of giving one paper to each player you just leave them on a table. People won’t know who is playing and who isn’t. Sharing information will be trickier. Made in about an hour after a twitter conversation about secret projects and how two people can tell whether or not they're working together on a secret project. Thanks to Alberto Rico for making a nice suggestion regarding the rules.